Listening to ‘Owned Music’ is the biggest loser in the audio space over the last five years. 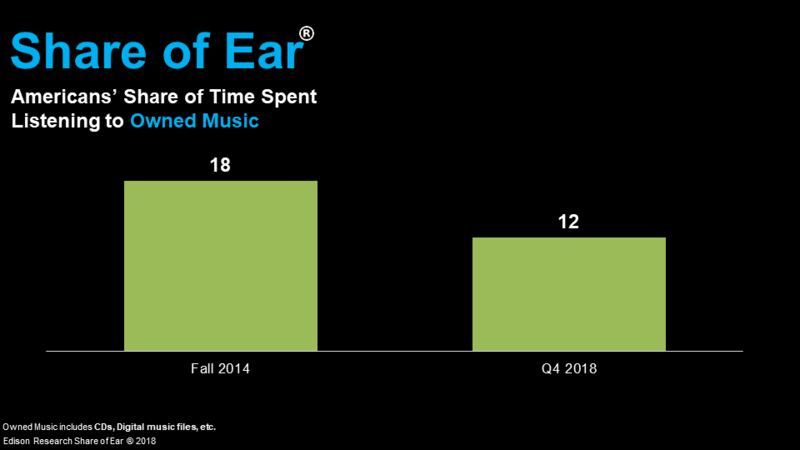 In 2014, Edison Research, the leader in the study and analysis of what people listen to in the USA and beyond, began the Share of Ear® survey, the first study designed to measure the total audio space. Having now completed five full years of this rolling study, we can look at the biggest changes over this dynamic time for audio. In 2014, 18% of all audio consumption came from music that people owned, whether it be their CDs, owned digital files, vinyl, cassettes, or any other format. At the end of 2018, this share has fallen to 12%. The loss of six ‘shares’ of listening constitutes the biggest change, up or down, documented by “Share of Ear” to date. Not only has the share of “owned music” fallen significantly, but the number of people who listen at all to this category in a given day is down by the same percentage. Five years ago 38% of all Americans ages 13 and older listened to owned music at some point each day, today this has also fallen by one-third to 25%. Naturally, these declines are accompanied by increases in other ways for people to consume music. Where exactly this listening moved to may seem obvious – but it’s not entirely what most people might assume. These gains will be discussed in a subsequent blog post. Edison Research conducts survey research and provides strategic information to a broad array of clients, including Activision, AMC Theatres, Apple, Disney, Dolby Laboratories, Google, Oracle, the U.S. International Broadcasting Bureau, Pandora, Samsung, Siemens, Sony, The Gates Foundation, and Univision. Edison is the leading podcast research company in the world and has conducted research on the medium for NPR, Slate, ESPN, PodcastOne, WNYC Studios, Wondery, and many more companies in the space. Another specialty for Edison is its work for media companies throughout the world, conducting research in North America, South America, Africa, Asia, Australia, and Europe. Edison is also the leading provider of consumer exit polling and has conducted face-to-face research in almost every imaginable venue. Since 2004, Edison Research has been the sole provider of Election Day data to the National Election Pool, conducting exit polls and collecting precinct vote returns to project and analyze results for every major presidential primary and general election.